ABUJA – NORTHERN youths under the aegis of Coalition of Northern Groups Thursday issued another threat, calling on the United Nations (UN) to as a matter of urgency, pronounce the Indigenous People of Biafra (IPOB) as a terrorist organization. This is coming one month after the same group gave the Igbo a quit notice to leave the north before the 1st of October, 2017. Addressing Journalists Thursday in Abuja, the Arewa youths also called on the UN to intervene, by initiating processes for a peaceful referendum, saying that it is the only option to finally settle the Biafran issue. In a letter addressed to the UN and dated 12th of July, 2017, which the groups made available to Journalists yesterday, they stressed that since the end of the Nigerian Civil War, Igbo have intermittently continued to taunt and rebel against other parts of the country, by demanding to secede and form an independent country, adding that they are reopening old wounds by calling for violence and anarchy. According to the group, the popular Kaduna Declaration that they should leave the north was not a call to violence, but a precaution. Speaking on behalf of the coalition, its coordinator, Shettima Yerima, said: “Not withstanding all the efforts by the Acting President and responsible regional leaders, Nnamdi Kanu, leader of IPOB, remains undaunted and even intensified their violent divisive campaign which is the main issue of contention. “Their continued action is a clear signal that they are committed to breaking away from the Nigerian federation which buttresses our earlier concerns. 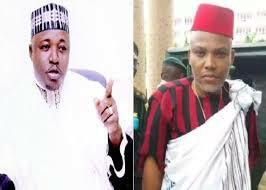 “Worried by the recent threats, we became concerned that Kanu has finally crossed the boundaries of Nigerian laws and has blatantly breached international laws that specifically frown at the use of terror to achieve a goal. “We are calling on the UN to invoke the relevant statuses to which Nigeria is a signatory to pronounce Kanu and IPOB as a terror outfits, proscribe their activities and initiate criminal actions against them. “Since it is becoming all the more obvious by the way IPOB and Kanu enjoy massive support from the Igbo back home that the issue of the drive for Biafra nation is still a boiling one, we urge the UN to intervene by initiating processes for a peaceful referendum as the only option to finally settle the Biafran issue.” The letter the Coalition of Northern Groups made up of fourteen northern associations wrote and addressed to the Resident Coordinator, United Nations, read in part, “To prevent the impending war and genocide being incited by Kanu’s IPOB, we urge the international community to look deeply into the evidence We have attached here and make a necessary decision in line with what International law and the international criminal curt laid down as precedents in dealing with people and groups that openly call for war and genocide. “We further submit that the Conduct of Kanu and IPOB qualify as acts of terrorism against the state and the people they target. We rely on the UN! Security Council Resolution 1566 read alongside resolution 1373 that qualifies terrorism as: “criminal acts, including against civilians, committed with the intent to cause death or serious bodily injury, or taking of hostages, with the purpose to provoke a state of terror in the general public or in a group of persons or particular persons, intimidate a population or compel a government or an international organization to do or to abstain from doing any act. “In line with the above resolution, it is our belief that the campaign waged by Kanu and his group constitutes, to a large extent, acts of terrorism as it provokes a state of terror in the general public’ and ’intimidates a population. ” It is equally important to stress that Kanu and IPOB have, in their campaign, carved out territories they intend to annex in their planned Biafran nation, even when some of these places are outside the key five lgbo States of the South East. “The leaders of these neighboring states have since expressed deep concern and apprehension that the grand plan of Kanu and IPOB is one that also includes the design to annex unwilling neighbors. This is not only against international Law, it is also a catalyst for violent resistance as we have seen in various parts of the world; the recent being Crimea. “The position of international law is also clear as contained in the ICJ report 1986: “A Prohibited intervention must..’. be one bearing on matters in which each State is permitted, by the principle Of State sovereignty, to decide freely One Of these is the choice of a political, economic social and cultural system end the formulation of foreign policy. Intervention is wrongful when it uses methods of coercion in regard to such choices, which must remain free ones.” ICJ Reports 1986, Judgment, June 27, 1986, p. 14, 108 (Para. 205) “We accordingly demand that the only enduring solution to this scourge that is being visited on the nation is complete separation of the states presently agitating for Biafra from the Federal Republic of Nigeria through a peaceful political process which includes: “Taking steps to facilitate the actualization of the Biafran nation in line with the principle of self-determination as an integral part of contemporary customary international law. “The principle of self-determination has, since World War II become a part of the United Nations Charter, which states in Article 1(2), that one of the purposes of the UN is “to develop friendly relations among nations based on respect for the principle of equal rights and self-determination of peoples. “We submit that this protocol envisages that people of any nation have the right to self-determination, and although the Charter did not categorically impose direct legal obligations on member States; it implies that member States allow agitating or minority groups to self-govern as much as possible. “This principle of self-determination has since been espoused in two additional treaties: The United Nations Covenant on Economic, Social and Cultural Rights and the United Nations Covenant on Civil and Political Rights. Article 1 of both international documents promote and protect the right of a people to self-determination. State parties to these international documents are obliged to uphold the primacy and realization of this right as it cements the international legal philosophy that gives a people the right to self. determination. “As the Biafran agitation persists and assumes threatening and violent dimensions, we submit that there is a need for the lgbo to have the opportunity to exercise the right to self-determination as entrenched in the aforementioned international statutes to which Nigeria is a signatory.” In their prayers, the groups said, “We call on the UN to, on behalf of the peace loving and good people of Nigeria, impress on our International friends and partners, i.e. the United States, the United Kingdom, France and Israel to distance themselves from these threats to peace made by Kanu and ban further activities of his violent group on their soils in addition to appropriately labeling it a terror organization. “Recognizing the right of self-determination in international law as the legal right of a ”people” to attain a certain degree of autonomy from a sovereign state through a legitimate political process, we strongly demand for the conduct of a referendum in a politically sane atmosphere for the Biafran lgbo to have a democratic voice over their future and the future of the nation. “We pray the UN to call on all lgbo from all over the country and in the Diaspora to converge in their ‘region in the South-East for a plebiscite under the supervision of the UN and other regional bodies to categorically decide between remaining with Nigeria or actualizing the Biafran dream.